24 July 2012 - ABIM announces Medicare payment incentives for participation in their MOC program on their website. August 14, 2012 - Robert Wachter, MD assumes chairmanship of the ABIM, writes missive on his industry-sponsored blog justifying why board certification "matters more than ever." This post shows anticipated collusion for acceptance of MOC as a "quality measure" between Medicare, the Joint Commission, the Federation of State Licensing Boards, and the ABIM Foundation's Choosing Wisely campaign. Wachter fails to mention his simultaneous affiliation as director of IPC The Hospitalist Company, Inc., a company that "is the nation's leading national physician group practice focused on the delivery of hospital medicine and related facility-based services" in that announcement. 27 Apr 2013 - Drs. Wachter and Cassel named to Modern Healthcare's "Most Influential Physician Executives." 1 Aug 2013 - Robert Wachter, MD receives 1,355 shares of IPC The Hospitalist Company stock options valued at $50.68 per share (Market Value: $68,671.40). 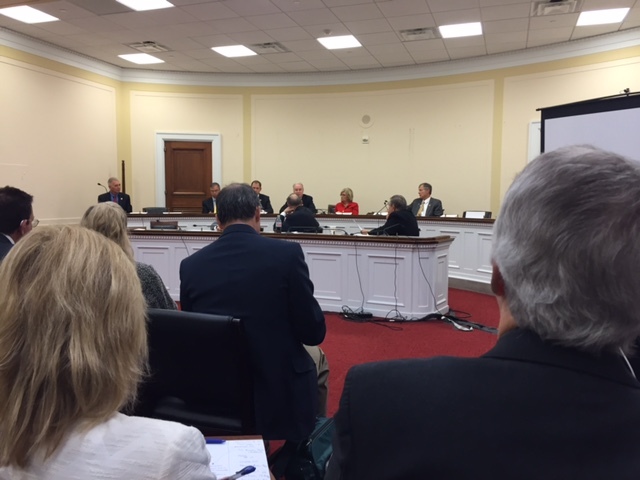 12 Jun 2013 - ABMS lobbies Chairman Upton and Ranking Member Waxman of the US House of Representatives Energy and Commerce Committee to have MOC program included in MACRA (the SGR Fix bill) as a physician quality measure. 30 June 2013 - Christine Cassel, MD to step down from ABIM as President and CEO of ABIM and ABIM Foundation. Earns $1.7 million as she leaves to begin work at the National Quality Forum. 1 Jan 2014 - ABIM offers either one-time (every 10-years) or annual payment plan option for its MOC program. 10 Dec 2014 - Study appears in JAMA showing no effect of MOC program at improving patient outcomes. 16 Dec 2014 - The first detailed review of the MOC corruption appears on this blog with the publishing of "The ABIM Foundation, 'Choosing Wisely' and the $2.3 Million Condominium." 30 Jan 2015 - The ABIM is caught in the act if omitting 6 key financial schedules from its 2014 Consolidated Financial Statement that it released to the public. 31 Jan 2015 - A virtual tour of the ABIM Foundation's condominium is published. 3 Feb 2015 - ABIM issues previously unimaginable apology to the physician community stating "ABIM clearly got it wrong" but fails to mention the financial, tax filing, and financial conflicts of interest of its President and CEO and members of its board leadership. 3 Feb 2015 - Physicians (especially this one) are not impressed with ABIM's announcement that failed to acknowledge ABIM's history of serious financial and public reporting actions. Work continues to uncover what's being hidden. 16 Feb 2015 - ABIM initially fails to publish full financials for 2014 until pressured to do so. Apparent cover-up continues. 10 Mar 2015 - Veteran Newsweek reporter Kurt Eichenwald publishes his first take on the MOC controversy with his article entitled "The Ugly Civil War in American Medicine." 11 Mar 2015 - ABIM Board Chairman David H. Johnson, MD issues statement attempting to discredit Eichenwald's article claiming "numerous and serious misstatements, selective omissions, inaccurate information and erroneous reporting." Johnson disputes claims that ABIM pass rates have fallen, that ABIM has a monompoly on re-certification, claimed that Eichenwald was "selective" about the data presented and has a "poor understanding" of the tax records, and that Eichenwald had failed to disclose his wife was an internist. 30 Mar 2015 - New board (NBPAS.org) formed and doctors are moving on after more of the financial transgressions come to light. 3 Apr 2015 - Dr. Robert Wachter, the former chairman of board at the ABIM, tops Modern Healthcare's Top Fifty Most Influential Physician Executives and is "not afraid to challenge the status quo." Not surprisingly, Dr. Christine Cassel again makes the list as well. 7 Apr 2015 - Kurt Eichenwald's next Newsweek article on the ABIM MOC program, "A Certified Medical Controversy," is published and begins to target many of ABIM Board Clair David H. Johnson's criticisms. 8 May 2015 - Consequences to physicians who fail their unproven MOC re-certification secure examination published online. 21 May 2015 - Kurt Eichenwald's third expose on the ABIM's finances called "Medical Mystery: Making Sense of ABIM's Financial Report" hits the pages of Newsweek disclosing the unreported lobbying efforts and the convoluted and large payments made to the ABIM leadership including $1,712,847 made to Christine Cassel, MD in fiscal year 2014. 22 May 2015 - Richard Baron, MD publishes another official ABIM response to Kurt Eichenwald's articles claiming "we have never made any effort to obfuscate, hide or delay ABIM's financial information." Baron did not acknowledge that they failed to release all of their audited financials (see 16 Feb 2015 entry on this timeline). Baron also fails to mention that the ABIM failed to release 12 years of audited financials requested by a reporter from the Wall Street Journal in August 2014. Additional attempts to obtain the reports from the PA Attorney General's office were also unsuccessful. Financial data were only obtained after a request was made to the office of the Pennsylvania governor's press secretary. 23 May 2015 - ABIM, it's finances, and the great revolving door collusion between the National Quality Forum, the ABIM, ABIM Foundation, and other specialty organizations published. 31 May 2015 - The ABIM's tax-filing cover-up of its lobbying activities with Congress exposed. 29 June 2015 - Robert Wachter, MD attempts to defend the actions of the ABIM on his blog after leaving his post as Chairman and speaks out. No corporate conflicts of interest are specifically mentioned by Dr. Wachter. Comments to his post are worth a read. 28 July 2015 - An independent cost analysis of the ABMS MOC program in published before print in the Annals of Internal Medicine. 15 Aug 2015 - ABIM Foundation tries to bury its old "About Us" webpage that claimed the creation date of the Foundation was in 1999 by editing the page to disclose the correct date of origin (1989) and then includes information regarding "$55 million" that was transferred from the ABIM to its Foundation from 1989 to 2007. The amount transferred was actually much larger and made secretly without disclosing the Foundation's existence to the physician community or public until 1999. The reasons for the secrecy and large annual payments made to the now defunct 1838 Investment Advisors (a spin-off of Drexel Burham Lampert financial fiasco - most of whom were indicted) made during that time have never been investigated or disclosed. One thing is now clear: it does NOT appear the sole reason for creation of the ABIM Foundation was to define and promote the term "medical professionalism" as originally claimed by the Foundation. 9 Sep 2015 - The ABIM's prior activities stumping for Big Tobacco in 1963 are revealed, lending less credibility to their claim that their certification program is for "public good." 15 Sep 2015 - Veteran Newsweek reporter Kurt Eichenwald publishes his last installment of a four-part series on the ABIM scandal entitled, "To the Barricades! The Doctors' Revolt Against ABIM is Succeeding!" highlighting how the ABIM MOC program has hurt physicians and patient care and what doctors are doing about it. 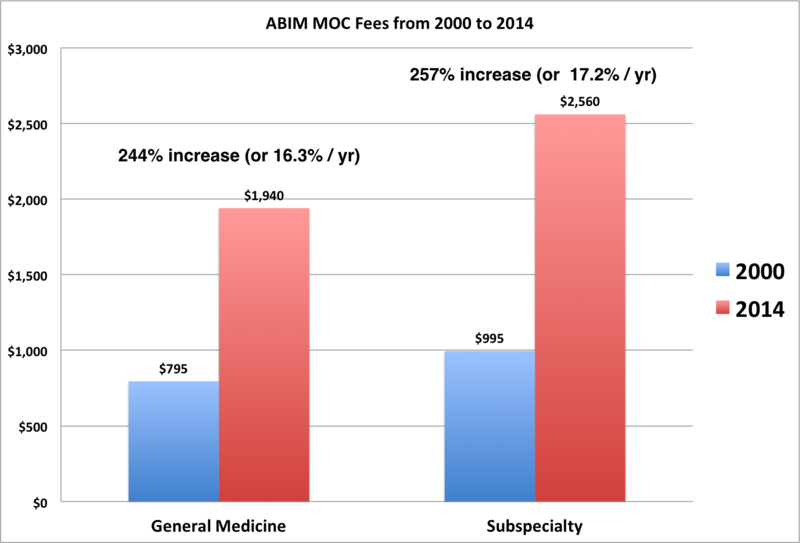 23 Sep 2015 - Graph of the growth in ABIM MOC Fees from 2000-2014 published showing at least 244% growth in cost (16.3%/year - far exceeding inflation) to internists over that 15-year time period. 25 Sep 2015 - ABIM's own Maintenance of Certification First-Time Pass Rates from 2000-2014 are published and document a negative pass rate trend line over that period of time in every subspecialty of internal medicine except Geriatric Medicine. The data trend stands in stark contrast to ABIM Board Chair David H. Johnson, MD's statement regardng MOC pass rates made 11 March 2015. 11 Nov 2015 - Concerning conflicts of interest with Christine Cassel, MD and the little-known company CECity, Inc. are published. Cassel's long-standing relationship with Premier, Inc. raises real questions regarding possible insider funding of CECity to prop up its value prior to its purchase by Premier, Inc. on 4 August 2015 for $400 million. 23 Nov 2015 - TeamHealth (TMH) acquires IPC The Hospitalist Company for $80.25 per share netting Dr. Wachter and his university, the University of California, San Francisco, a comfortable profit. 23 Nov 2015 - Graph of ABIM legal fees pre-ABMS MOC program (instituted in 2005) vs. post-MOC (ongoing) appears. 29 Nov 2015 - ABMS's income stream for selling daily updates of physician certification status from the unproven and un-vetted data gathered from its member boards via ABMSSolutions.org disclosed bringing the legitimacy of the entire ABMS MOC empire sharply into question. 6 December 2015 - A copy of the physician sanction letter issued June 8, 2010 surfaces on this blog and gives a glimpse into the strongman/boss tactics used by the ABIM to protect their certification monopoly. The tactics used to track down physicians late after they participated in a board review course years before are now coming under intense scrutiny. 16 Dec 2015 - ABIM announces its intent to extend its practice assessment decision through 2018. 17 Dec 2015 - Christine Cassel, MD leaves her role as the President and CEO of the National Quality Forum (in charge of setting "quality" standards for the nation's hospitals) to join the leadership team of Kaiser Permanente's School of Medicine. Dr. Cassel had long-standing financial dealings with Kaiser since at least 2003. Yes, folks, it has been quite a year. Still, various member boards of the ABMS continue to try to modify and "improve" the highly conflicted and ethically corrupt ABMS MOC program. While I would like to have other things to write about on this blog from time to time, I find it important to continue to expose the corruption and financial conflicts created by the ABMS and their member boards. 2016 promises more developments as others begin to dip their toe into exposing this complex and unfortunate story. 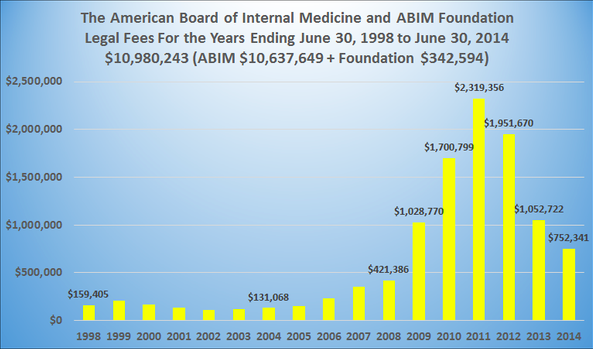 My prediction for 2016: the ABIM collapse under its own spending weight but not before "grants" are issued from the ABIM Foundation back to the ABIM to support its operations. If the ABIM does collapse, what happens to the certification process for US internal medicine physicians? Clearly, significant change (including electable board members and disclosure of conflicts of interest publicly) are of paramount importance. Returning board certification to a lifetime designation also seems paramount since the MOC program continues to prove itself as highly destructive to our profession. So stay tuned in 2016. 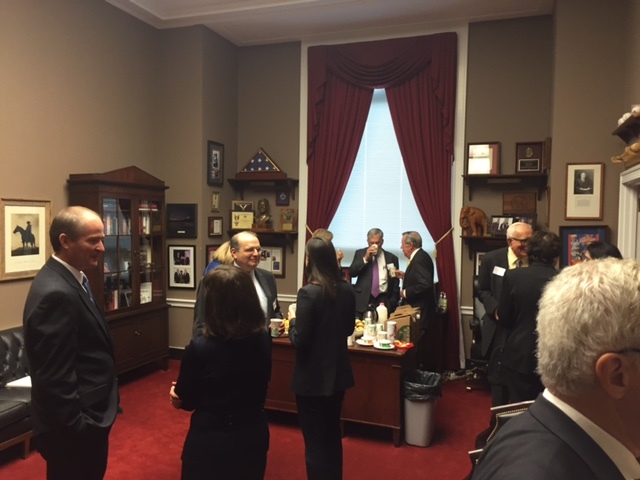 It promises to be an interesting year as more revelations regarding the ABMS MOC program develop. Addendum: 28 Dec 2015 @13:04 - Post updated to include 27 Dec 2012 and the failure of Dr. Baron to report his conflicts as Director of the Seamless Care Model Group in the NEJM publication. Also, 28 July 2015 was added to include the cost analysis of the ABMS MOC program published in the Annals of Internal Medicine. Addendum: 28 Dec 2015 @ 13:21 - 27 Dec 2015 deleted from timeline - Author of the NEJM piece was Robert Baron from the University of California, San Francisco, not Richard Baron, MD - hence why there was no disclosure of this conflict on the NEJM publication. I regret the error. Addendum 30 Dec 2015 @ 10:45 - Timeline updated with additional information revealed on 23 Sep 2015 and 23 Nov 2015 regarding growth of costs and legal fees. Democratic political stars with Chicago ties — from his old boss President Barack Obama to presumptive 2016 Democratic nominee Hillary Clinton — must enjoy hearing it. While Chicago is embroiled in a horrible police scandal uncovered by the flow of information via the digital age, I couldn't help but think how true Mr. Kass's words were in terms of US medical care and the control of practicing physicians on the front lines of health care today. While nowhere near the seriousness of the police story in Chicago, the story of similar strongmen/boss tactics used against practicing physicians is a sad story that has been growing for years. Until recently, physicians have been oblivious to these tactics used by the American Board of Medical Specialties (ABMS) (based in Chicago) and the American Board of Internal Medicine (ABIM) who used their political and professional connections to foist their Soviet-style strongmen tactics on practicing physicians via their board re-certification requirement called "Maintenance of Certification®." Participate every two years or lose your job. Participate every two years or never see another penny from a major insurer. Attend a board certification course that does not bow to the ABMS/ABIM strongmen? It is a threatening letter, issued by a non-physician Chief Operating Officer of the ABIM who served as strongman for the ABIM and ABMS and later earned a $297,646 bonus from the ABIM in FY2012 (Page 22). 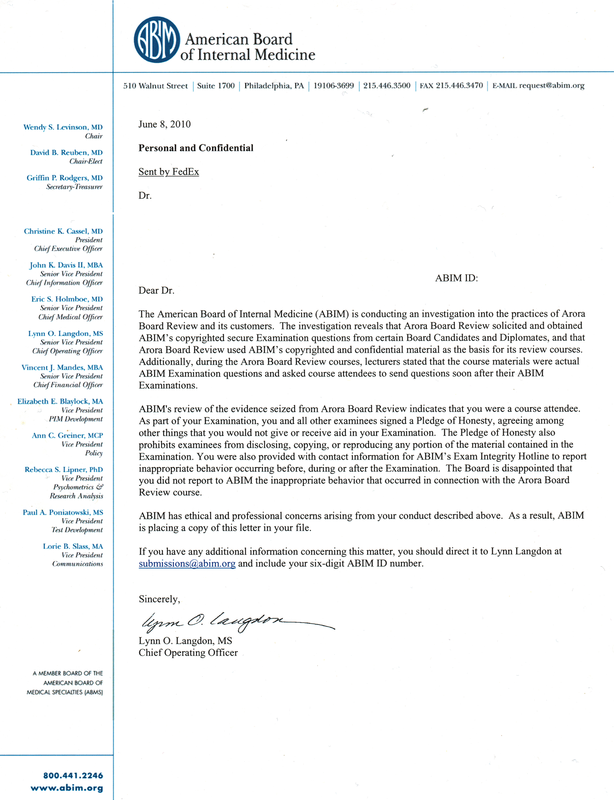 The letter suggests the physician-attendee of the Arora Board Review Course violated a "Pledge of Honesty" and failed to call the obscure and unvetted ABIM Exam Integrity Hotline. And because the ABIM now has "ethical and professional concerns" about that physician, it is "placing a copy of this letter in your file." 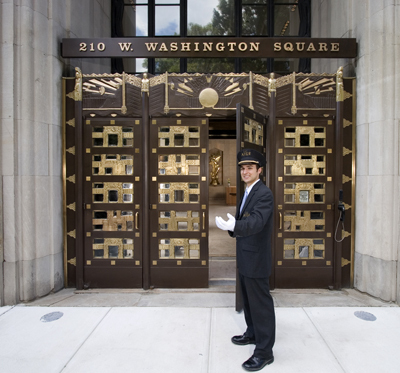 Maintenance of Certification®: the Chicago Way. To think this whole process was been transported from Chicago to Washington, DC and is now deeply embedded in the Affordable Care Act as a physician quality registry, courtesy of heavy lobbying by the ABMS (and likely the ABIM), is sickening and wrong. Practicing physicians, like the citizens of Chicago, deserve to know the truth of how and why this occurred. PS: Ms. Langdon no longer serves as Chief Operating Officer of the ABIM. She was quietly replaced by Nkanta “Nick” Hines, MSc, MBA. Ms. Langdon now serves as a board member of the American Board of Medical Specialties. I looked out the airplane window and saw we were approaching Reagan National Airport from the south. The crisp morning sun pierced the fluffy clouds and found its way through the slit of the partially-opened airplane window shade to momentarily blind me. A small apex of the Washington Monument could be seen in the distance. 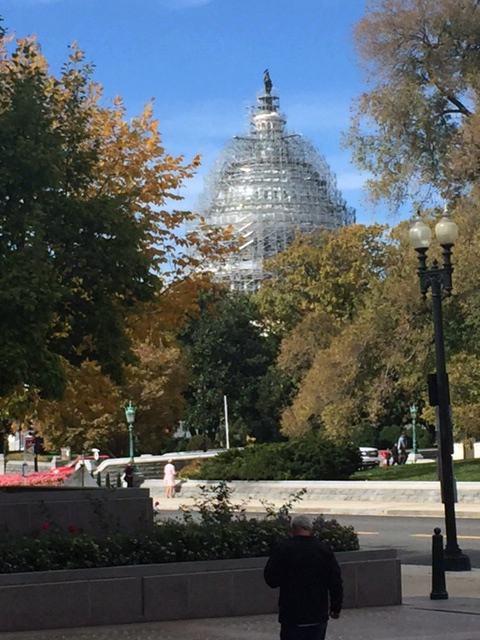 To its right, the US Capitol dome shrouded in scaffolding. Having my luggage, I Uber-ed my way to my hotel. Boutique hotel next to the Capitol. Nice place. Quaint pastel-painted row houses nearby. French bistro, too. A 30-somthing hipster lady was checking out as a host brought her a few knickknacks to munch on for breakfast. The smartly dressed man behind the front desk had an Australian or South African accent. Or was he from Belize? I couldn't tell. Relaxed. Confident. Good eye contact. He checked me in. This is the life of a policy wonk, I caught myself thinking. My room was larger than I needed, the bathroom tiny, but functional. I pulled back the curtain and saw the many marble buildings surrounding the hotel and blocked the viewed of the streets further away that I remembered weren't quite so inviting. Lots of construction in view. Booming. 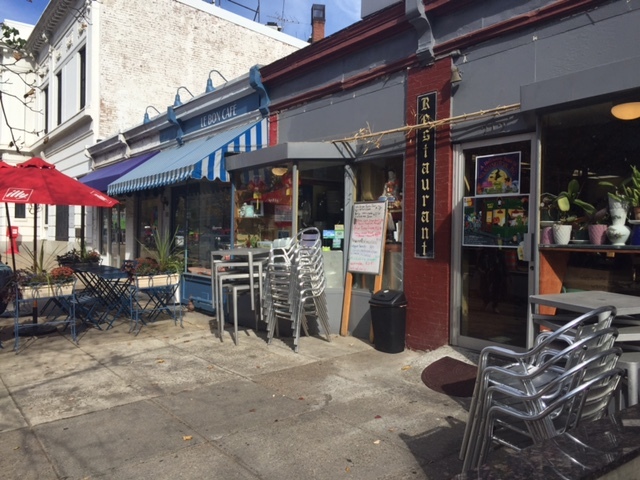 I wondered if any of the other people who frequented this establishment ever saw the very different life that exists in rural areas outside the Beltway. No matter. It was Washington. Time to explore. Crisp air. School kids bursting with excitement and rushing to the street corner, starry-eyed. Ever-patient chaperons shouting they could only see the Capitol if they made two parallel lines. "Quiet, please! Line up. Come on, now." Others in dark suits walking the streets. High heels with lanyards and name badges. People walking in tandem, sharing secrets, telling jokes. Black Towncars, Escalades with tinted glass, Mercedes. Large white buildings that dwarfed their visitors, like Poseidon looking down on a flotilla of tiny ships at sea. 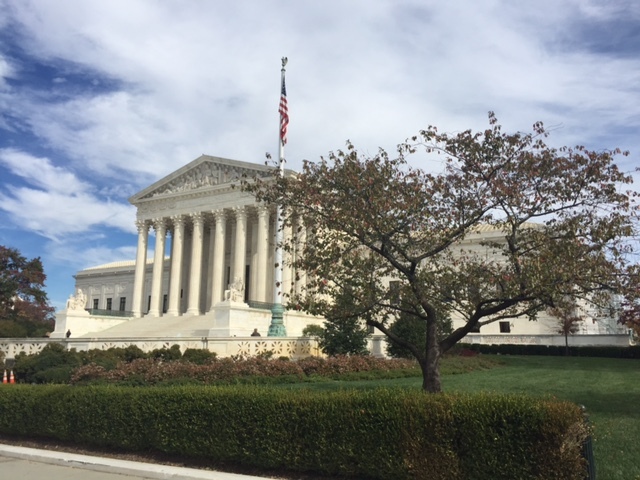 Supreme Court. Library of Congress. Madison, Jefferson, Dirksen, Hart, Cannon, Longsworth, Rayburn. White. Marble. Big. Powerful. At least so it seemed. Certainly not for the faint of heart. Security everywhere. Metal detectors. Strange white mechanical roadblocks that clanked up and down to let the Important People drive their beat-up Subaru over it to head home. A foreign land for a practicing doctor. Almost surreal. I had arranged to meet two colleagues before the introductory dinner gathering. Each a name on The List. We never met before but shared some emails once. Nice to put faces with the names. They were more seasoned in this environment than me. But real doctors. Not pretend. Independents. Just came from work. Drove all day or flew from far away. Eager to meet others. Passionate. Each with their story - a reason to be here. Certain they could speak to a piece of the puzzle. Frustrated with things but determined to do something. I settled in. We exchanged numbers. You on Twitter? Defiantly: "Why should I use a smartphone when a tiny flip phone will do?" Soon we headed to the introductory dinner. Staffers handing out sticky paper name tags that never seem to stick. (Except to things they shouldn't.) Pleasant smiles. A glass of wine. Pasta on the menu. Mingle. Where are you from? I see. The Congressman will be here a bit later. Then the Congressman arrived. Thanks for coming. Relax. Enjoy your stay. Tomorrow we'll show you our plan. Want to get your ideas, feedback. What brings you to Washington? They all seemed to know. Me? Better to lay low for now. Who are all these people, really? Would what I had to say make any difference? There was another plan. Another agenda. Mine? Very small, unimportant. One doctor with a few others in a big very big pond, treading water, learning to swim. Would this be worth it? Others seemed to think so. Today, the Department of Justice announced that it has reached settlements in its investigation of hospitals for billing Medicare for ICDs implanted in Medicare patients that did not meet Medicare coverage requirements. The announcement includes 70 settlements involving 457 hospitals in 43 states for more than $250 million. The Heart Rhythm Society (HRS) has recognized that the misalignment between the Medicare National Coverage Determination and the clinical practice guidelines created gaps between the payment policy and clinical decision-making and places physicians and their patients in an untenable position. To help mitigate the problem, HRS published "2013 HRS/ACCF/AHA Expert Consensus Statement on the Use of Implantable Cardioverter Defibrillator Therapy in Patients Who Are Not Included or Not Well Represented in Clinical Trials”. Moving forward, the Society’s priority is to do everything possible to assist the heart rhythm care community in managing the patient care pathway. HRS and other medical specialty societies are currently working with the Centers for Medicare and Medicaid Services (CMS) to identify the appropriate time to reopen the existing national coverage policy. The Society will provide CMS with recommendations to update the clinical indications for reimbursement. With this preparation, we stand ready to work with our partners to revise the Medicare coverage policy to reflect current clinical practice. Outdated CMS National Coverage Decisions from 2005 just whacked hospitals. "Misalignment's" Catch-22. So much for evidence-based medicine. So much for practice guidelines. So much for innovation in health care. CMS NCDs rule now, no matter how outdated, from now on. The Justice Department has spoken. References: Justice Department press release with list of hospitals affected. More on the history of this action here. In Washington (DC), it's about access." The invitation came in a regular envelope. An invitation to go to Washington DC. Who asked me? What was this for? Was it real? 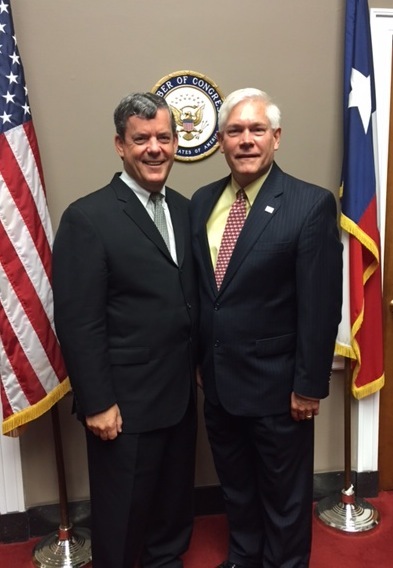 I studied the invitation: a "personal" invite from Congressman Pete Sessions (R-TX), dinner the first night (dutch treat), then meetings started the next day at 08:30 am in the Rayburn Building, presentations, other Senators and Congressman to be invited (names to be decided). New plans. Need input, discussion, dinner afterward. I showed the invitation to my wife: "Do you think this is the real thing? Why would they ask me?" "Looks real. Call them," she said. "Find out who's going. Maybe there's someone you know. "(My wife, unphased, used to testify on the Hill when I was a young staff doctor at the National Naval Hospital in Bethesda, MD many years ago). I waited a few days, then called. "Well, fifty-five doctors have already RSVP'd so far," said the exasperated voice on the end of the line." Ugh, I thought. "We'll be sending out a revised agenda with a list of the attendees when the date gets closer." Would it be worth it? Fifty-five doctors? 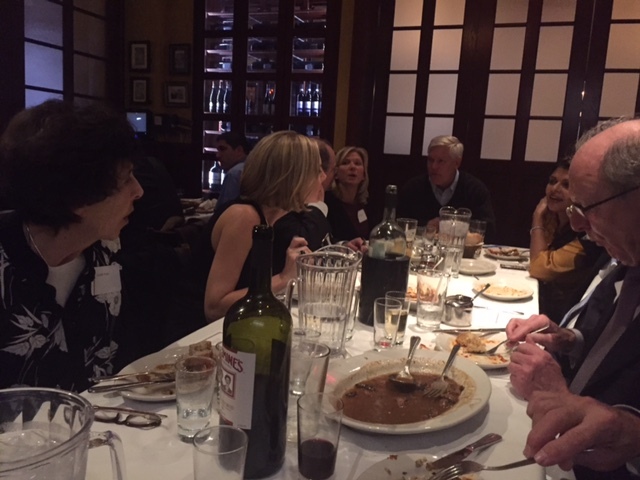 Were doctors being asked to come to Washington at their own expense just so it would look like we were "at the table" when, in fact, we were "on the menu?" Given health care's recent history and how things got to where we are now, it was very hard to suppress my cynicism. Who funds Representative Sessions, I wondered? I checked. Got it. Then I really pondered: why me? My wife looked at me like I was an idiot. "You have to go," she said. "You can't go through all of these hours of investigation, research, fire, and brimstone, and not go to Washington. Make some appointments. Maybe you could stay with our old friends Jack and Jill (not their real names) while you're there." "But the time from work... it's so expensive..."
That night, I stared at the computer screen on my desk. "How much does it cost to fly to Washington?" I searched Orbitz. I'd have to cancel a clinic day, maybe two. Maybe I could swing this if I only missed an extra half a day of my clinic. Folks at work won't like this. Oh heck, she's right. I'd never forgive myself if I didn't go. After weighing things, I booked the flight, then rearranged and blocked my clinic schedule the next day, though I still wasn't sure. Will it be worth it? A few weeks later a more finalized agenda came with the names of who would be attending. I googled everyone (this seemed to take forever). I made a list. 18 states. Most were practicing doctors. Most of those orthopedic physicians, (Huh?) 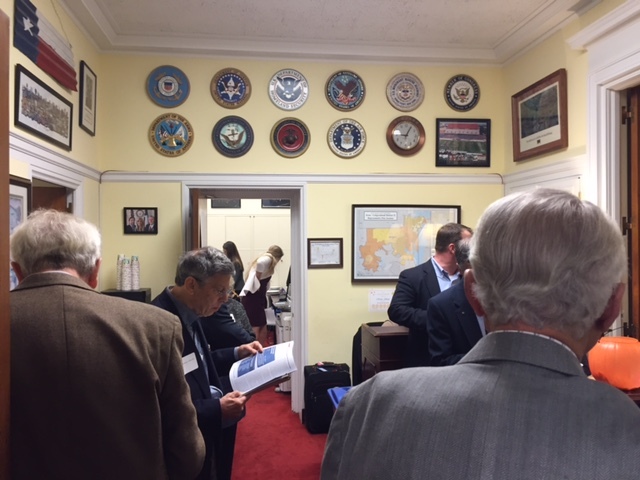 a few AMA representatives (young and semi-retired), a few older retired doctors, a few lawyers, an economist, a doctor who ran an ICD-10 coding company, a person who owned a medical collection company, some physician advocacy group representatives, a lobbyist. "Mouth of the lion," I thought. "How am I going to get a word in edgewise?" Fifty-five people had grown to sixty. "It'll be a waste of time," I thought. The next day I finished my overbooked clinic, then returned home to tell my wife what I had decided. I told her I probably won't go to Washington after all. "You have to go," she reinforced. Brand new bells'll be ringing." I'll be heading to Washington, DC on my own dime next week. Seems there are plenty of people who want to know more about the American Board of Internal Medicine. Who knows? Maybe I'll learn a thing or two, also. Can Medical Knowledge Be Copyrighted? I understand that ABIM examinations are confidential, in addition to being protected by federal copyright and trade secret laws. I agree that I will not copy, reproduce, adapt, disclose, solicit, use, review, consult or transmit ABIM examinations, in whole or in part, before or after taking my examination, by any means now known or hereafter invented. I further agree that I will not reconstruct examination content from memory, by dictation, or by any other means or otherwise discuss examination content with others. I further acknowledge that disclosure or any other use of ABIM examination content constitutes professional misconduct and may expose me to criminal as well as civil liability, and may also result in ABIM's imposition of penalties against me, including but not limited to, invalidation of examination results, exclusion from future examinations, suspension, revocation of certification, and other sanctions. Can you divulge this principle of gap phenomenon (and a similar example of this phenomenon) that once appeared in an almost identical way on your board examination to your residents? According the American Board of Internal Medicine (ABIM) and the above agreement, it would seem that I cannot. But is such a medical principle and my personal example displayed on this blog truly copyrightable by the ABIM? According to prior court decisions, under the principle of the "merger doctrine" my example does not violate the Copyright Act. In fact, according to Mazer v. Stein, 347 U.S. 201, 217 (1954), the Supreme Court stated "Unlike a patent, a copyright gives no exclusive right to the art disclosed; protection is given only to the expression of the idea—not the idea itself." This protects my First Amendments' free speech right and the fact that this same principle was shown to me years before by my mentor, Mel Scheinman, MD at the University of California, San Francisco when I trained as a fellow in cardiac electrophysiology. To be clear, the disclosure of an exact replica of a board question and its detractors (wrong answers) might be subject to a copyright dispute, but it is clear that simply mentioning to residents that you saw a "similar question" on your specialty board examination and providing an example to your residents and fellows does not compromise your ability instruct your residents about such an important electrophysiologic principle as "gap phenomenon." In actuality, it is hard to copyright medical information that is widely available in the medical literature. But this has not deterred the ABIM from continuing its legal battles against physicians who they claim may have shared information about their certifying examination question content. Currently, the ABIM is continuing to sue physicians for possible Copyright Act infringement of their secure board examinations from participants in the Arora Board Review course given in 2009 (! ), this time a young internal medicine physician from Puerto Rico (the full text of this suit can be viewed here). While this trial has yet to be heard, it will be interesting to see if the ABIM's Copyright Act infringement claims have merit. The suit is interesting because it gives a detailed accounting of the ABIM's test creation methods and the damages they hope to recover. I encourage my physician readers to review the suit. Even more interesting to me, however, is the answer to the claims made in the ABIM's suit by the defendant and the countersuit filed against them (seen here). The claims of the "ABIM Individuals' Illicit Conduct" (beginning on page 22) are important to review, for if they are found to be true, they offer insight into the extent ABIM will go to protect their intellectual property and the damages they inflict of physicians that might be wrongly accused, including the use of a "spy," claims fo the violation of a "Pledge of Honesty" that the defendant never saw, public claims that he was "unethical and unprofessional," and having only 10 days before every medical licensing board in his jurisdiction would be notified of the ABIM's decision, leaving (in my view) no opportunity for due process. These are extremely important issues for physicians to understand as the "restructuring" of the ABIM continues in light of the ABIM getting it "wrong" and the financial revelations and deceptive disclosure practices of the ABIM raised on this blog and elsewhere. If the court finds in favor of the defendant in many of the claims made by him, I have a feeling there will be many more suits against the ABIM to follow. It also raises the very real possibility that the ABIM Foundation was not created as a means to define and promote "medical professionalism," but rather to serve as a legal defense fund for the ABIM as they protect their monopoly interest in the physician specialty accreditation process. The American Board of Internal Medicine (ABIM) has announced that it will consider replacing its 10-year maintenance of certification (MOC) exam with shorter, more frequent testing that physicians could take home or in the office. The proposal to eliminate the 10-year examination is one of several recommendations issued today by ABIM's "Assessment 2020 Task Force," convened in 2013 to improve its controversial MOC progam for internal medicine (IM) physicians and IM subspecialists. ABIM released the task force report less than a week after the American Board of Anesthesiology (ABA) announced that it would replace its 10-year MOC exam with continuous online testing next year. "The results of the smaller, more frequent lower-stakes assessments would provide insight into performance and accumulate in a high-stakes pass/fail decision," the task force said in its report. "A failure at this point may necessitate taking a longer exam or another form of assessment in order to maintain certification." Let's think about this a moment. ABIM's Task Force 2020 wants to replace MOC with MORE testing, more often, and still reserve the right to force a physician to take a "longer exam or another form of assessment in order to maintain certification?" This isn't better, it's worse. Much worse. Instead of every 10-years, it will be daily or weekly MOC-minutes! More MOC distraction pushing physicians away from their patients and toward even more computer time. What are these "Task Force 2020" members smoking? Of course the money can't be denied. Pharmaceutical companies are licking their chops. Think how many MOC® questions we'll soon have to answer on novel oral anticoagulant use instead of that old, cheap, outdated warfarin! Pushed to our iPhones, these new MOC-minute® questions are sure to turn your head away from patient care toward an easy payment plan! I wouldn't be surprised that thanks to the ABMS stumping for Big Tobacco in the sixties, we'll all be answering questions on the praises of e-cigarettes and pharmaceutical aids for smoking cessation, too! It's truly fascinating to watch these attempts at social engineering of practicing physicians by the ABIM. But the ABIM has already tried voluntary re-certification and knows it failed miserably. They had to make it mandatory by veiled threats over what the loss of Board certification might mean or no one would pay into their scheme. 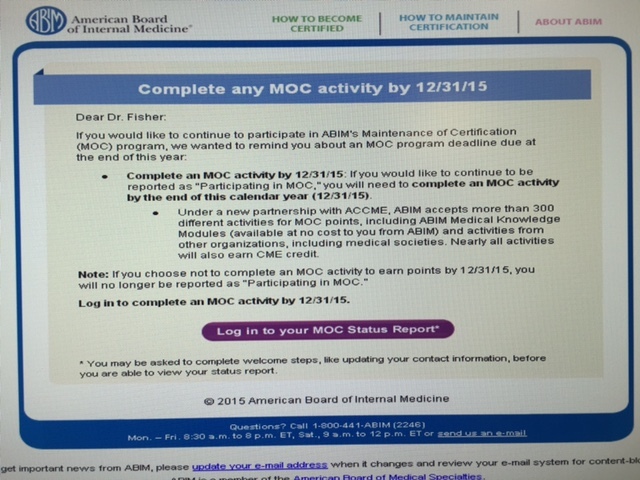 Want proof that the ABIM isn't serious about ending their MOC® exam? Read the contract physicians must sign before entering into the ABIM MOC® program. Read about "trade secrets" and "federal Copyright Act, 17 U.S.C. § 101, et seq." and "forensic techniques" they use to protect their products. And let's not forget that "disclosure or any other use of ABIM examination content constitutes professional misconduct and may expose me to criminal as well as civil liability, and may also result in ABIM's imposition of penalties against me, including but not limited to, invalidation of examination results, exclusion from future examinations, suspension, revocation of certification, and other sanctions." These guys and gals of the ABIM mean, er, BUSINESS! All this for a costly and completely unproven metric foisted on physicians to assure the ABIM's cash flow. MOC® isn't about physician education or patient welfare, it's about intimidation, $2.3 million condominiums, $1.7 million golden parachutes, and secret transfers of millions upon millions of physician testing fee dollars to the ABIM Foundation in the name of "social justice." It's about an organization that has allowed itself to sink $47 million in the hole (Fiscal Year 2014 Form 990 line 22) and balances its financials on a whopping $94 million in deferred revenue (Form 990 Page 11 of the pdf, Form X, line 19). That $94 million will be coming from somewhere (can you say "ACA?") and since the ABIM gets 98% of is fees from practicing physicians, you can bet your last silver dollar that these totally unproven MOC® programs will be paid for by practicing physicians, one MOC® exam or MOC-minute® at a time. And the ABIM is SERIOUS. Recently, despite all that has been uncovered about the ABIM, they continue to sue doctors over their intellectual property, just as before, this time in Puerto Rico (case 3:15-cv-01016). Oh, golly, what's a few more million dollars in legal fees to protect your income stream, right? If you believe there will be no MOC® exam of any type, ever, and given the honesty and integrity the ABIM has demonstrated over its finances over the past 30 years, I've got some ocean-front property in Arizona I'd like to sell you. 9 Oct 2015 06:00AM Link to ABIM's Puerto Rico case fixed. Patients are dropping like flies in Electrophysiology Laboratories across the country. Death and destruction everywhere. Poor quality. Unsafe standards. Pitiful results. Clearly this MUST BE THE CASE! That's why it's SO important that the Heart Rhythm Society and the Intersocietal Accreditation Commision (IAC) INSIST (seriously) that EVERY electrophysiology laboratory in the United states have a MEDICAL DIRECTOR certified by the American Board of Medical Specialties. Otherwise, your electrophysiology laboratory will be labeled as "NOT UP TO STANDARDS." And we wouldn't want that now, would we? Last week, I sent an email discussing the recent partnership between the Heart Rhythm Society, the Intersocietal Accreditation Commission (IAC), and other key stakeholders to develop and operate an EP Lab Accreditation Program. Developed by the IAC Cardiac Electrophysiology Board of Directors, the draft IAC Standards and Guidelines for Cardiac Electrophysiology Accreditation are now available for public comment and I am requesting your assistance on this important initiative. Please review the draft standards and provide feedback to ensure that they meet the expectations and the field’s needs. Listed below are the instructions to provide comments. The IAC Comment Form must be completed and submitted electronically by December 1, 2015. Click on the proposed Standard you wish to review and/or comment from the menu. A window will expand with the description of the Standard and a PDF to view the section of the Standards available for comment. Click on the PDF to open it in a separate window for review. On the right, fill in your name and provide your comments about the proposed Standards in the boxes provided. At the close of the comment period, the IAC Cardiac Electrophysiology Board of Directors will review all submitted comments, consider modifications, and vote on the Standards final approval. The new Standards will be posted to the IAC Cardiac Electrophysiology website and available for download in late 2015. Don't you get it? The new "Standards" are coming whether you like it or not. I would suggest every electrophysiologist comment on this decision by the Heart Rhythm Society to insist that EP laboratories must meet certain "standards" regulated by yet another unaccountable body to the physician and patient (who the heck is the "Intersocietal Accreditation Commission?") After all, this is ALL about regulatory capture and the money generated for the ABMS and their member boards. Where's the proof that patient care will be improved as a result of such standardization? Instead, everything (including our "re-certification" expenses) will cost us more and more as the regulatory capture of medicine by the ABMS and the IAC/ and their pals continues unabated.